Of late, Reuben has acquired a new interest to go with all the other obsessions. He’s into London Landmarks. Is it because his mother’s a London blogger and has dragged him around the capital on blogging jaunts for six years now? Is it because he was born opposite Big Ben and was wandering down the Southbank as soon as he could toddle? 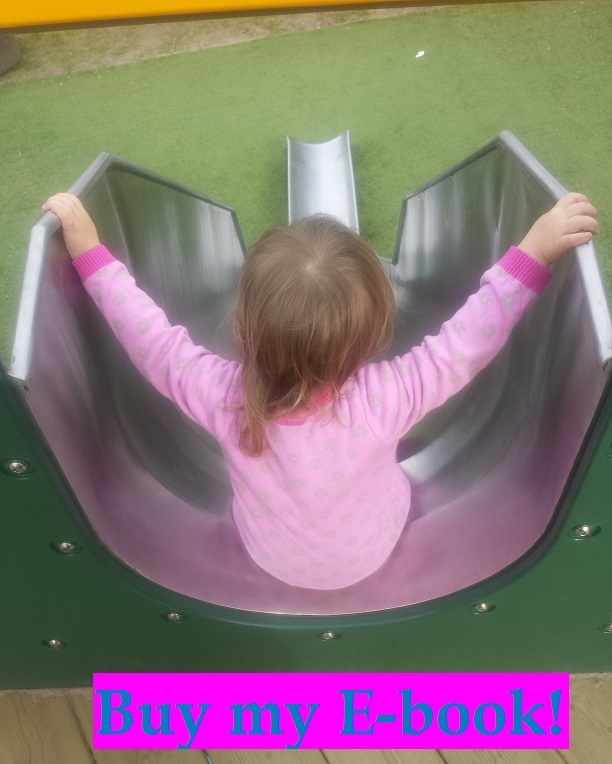 This photo was taken the same month I started the blog – proof, if it were needed, that I actually had a toddler when I choose this ever-so-specific blog title. 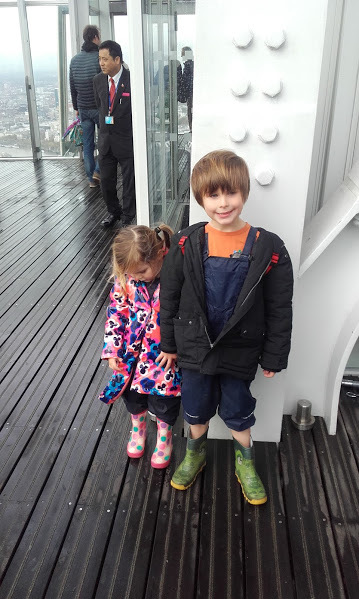 You’ll note that The Shard in the background isn’t finished at this point – Roo’s childminder was near Borough Market, so he and Nathan used to walk past the the building site daily and see how it grew. 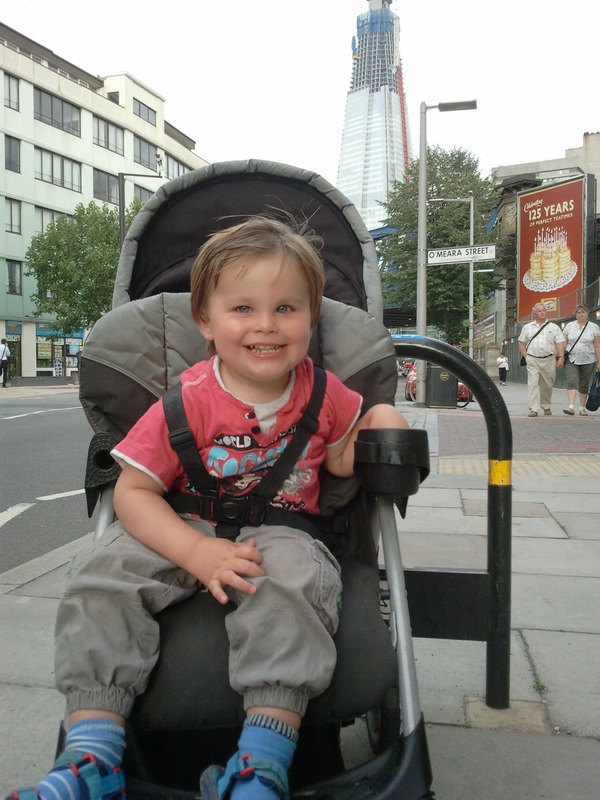 So, it’s kind of appropriate that – thanks to the Year 2 curriculum – it’s now his favourite London landmark again. It feels like we’ve cycled round somehow. 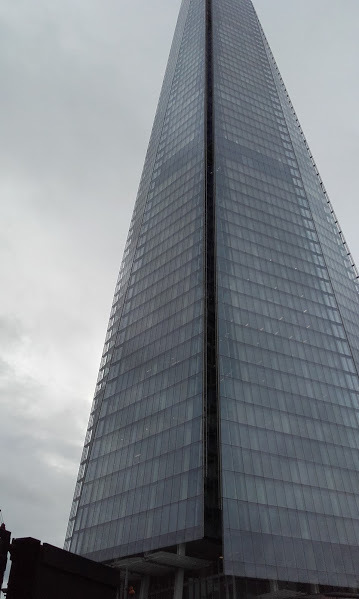 For half term, The Shard was doing a “Kids Go Free” offer, which is a substantial saving considering 4-16 year-olds cost £24.95 if you turn up on the day. You can pay less if you book 24 hours in advance and the same with the adult tickets (£25.95 as opposed to £30.95) but I didn’t know we were going 24 hours in advance, so was stung for the full £30.95 at the door. 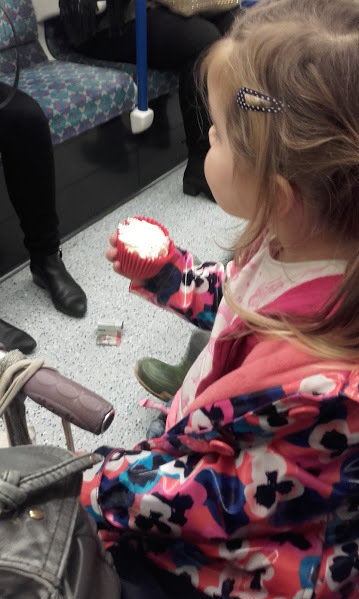 I was a little surprised by the price – if it hadn’t been kids go free, it would cost us £87 to go as a family. That’s more than entry to Paultons Park and that’s got Peppa Pig World. The Shard was going to have to be pretty impressive to justify that kinda price. I should probably point out that we weren’t going as a family, although many people made that mistake through the day. I was with H’sDada and H and it entertained us to see how many people thought Eva and H were twins. They’re the same age and they do look a bit similar so I can see why people kept asking us. It did confused Roo somewhat to be told to hug his Daddy during the obligatory pre-ascent photoshoot. Ah yes, the photoshoot. Another way The Shard is keen to take your money. Like a theme park, your photo is taken on the way in and then you can buy it on the way out, with the whole “family” superimposed on a background of your choice – the view by day, the view by dusk, the view by night. We were still feeling a little wallet-sore after the entrance fee, so skipped out on that one. It did give a real day-out feel to the entrance hall though, along with the airport security that made us feel a bit like we were on holiday. They had x-ray machines and everything. At one point H’sDada almost got wrestled to the floor for the sake of a 20p in his pocket. I only exaggerate slightly. Once we’d cleared security, the ascent was fairly swift. It was one life to Floor 33, then another to Floor 68. Within seconds we were 244m above sea level and I was feeling mildly sea sick. I may have mentioned before that I’m not overly fond of heights. But for £31, I was not about to turn around quickly. We were seeing this one through. And seeing stuff was pretty much what we were going to do for the next hour or so. 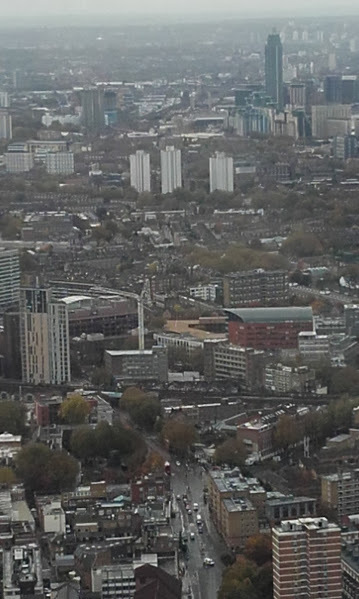 Lots of stuff, from high up. 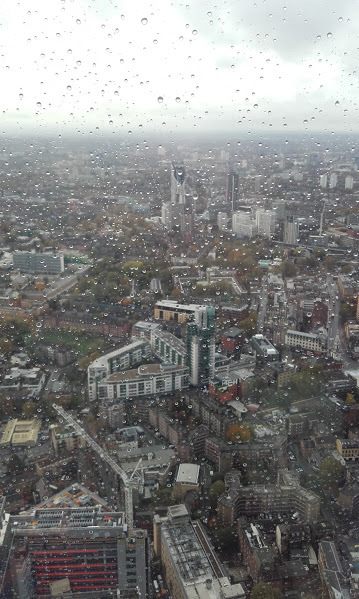 Yeah, it wasn’t the best weather for looking at views but it was good to be indoors. Gratifyingly for Roo, we could see a lot of London landmarks. All of them in fact. There was a telescope that you could use to zoom in on details so Reuben used it to look at St Paul’s Cathedral, another primary-approved landmark. 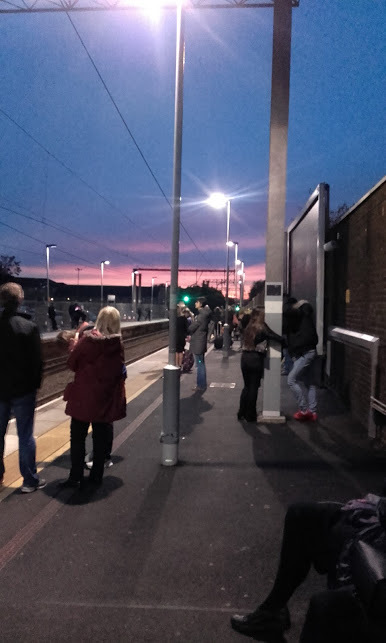 He managed to see it almost as clearly as he could just by looking through the window. 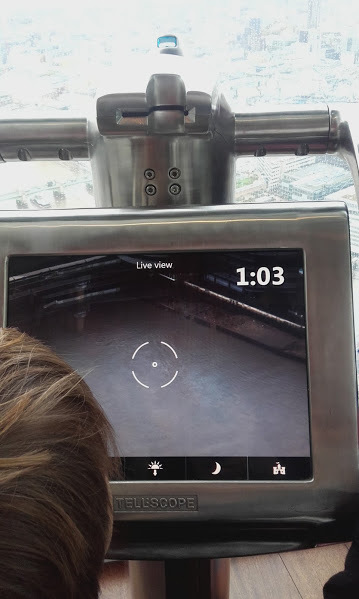 The viewing platform is 360 degrees so you can see all the London compass points and see the crazy way the Thames never seems to pick a direction and stick to it. 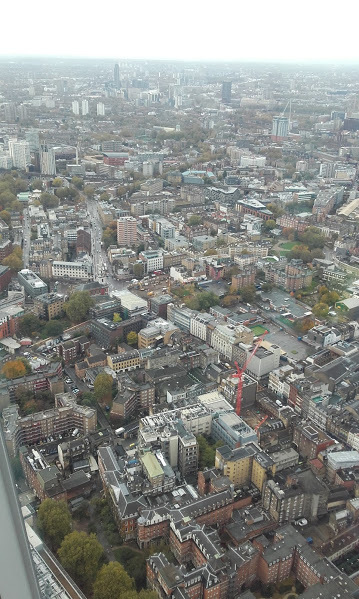 We saw a lot of bits of London. It was impressive but not hugely different from the view from the London Eye. I preferred the Orbit but then we only paid a pound each to go up there, so I was probably in a generous mood. If you want something similar for absolutely nothing, then get yourself admitted to the North Wing of St Thomas’. The 10th floor has a great view. Next, we went a few more floors up to the open air platform on Level 72. Now, Reuben wasn’t keen on that platform. It was windy and chilly and I think he was scared he’d fall off the edge. Let me reassure you that his fears, as ever, are unfounded. You can’t fall off the edge. But you do get the feeling of wind in your hair and how very high up you are and…you’re right Reuben. Let’s go back down. What’s that? 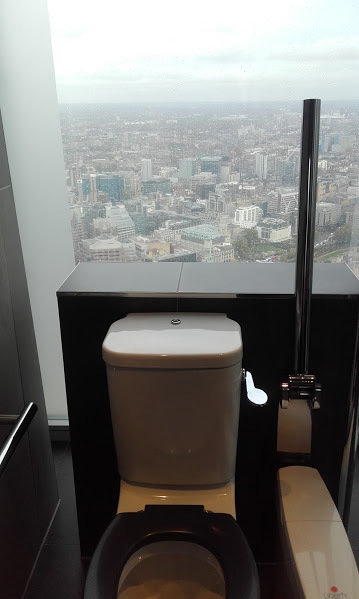 A loo with a view? Don’t mind if I do. By now, it was 11am and we’d spent an hour wandering around at altitude. It was lunch time and the kids were demanding, variously, ham toasties, hot dogs, beans on toast and sausage sandwiches. All of which might be a tough call in trendy-foodie Borough. After a few false starts, we chanced upon Cafe Rossi. It looked tiny from the front but had a seating area at the back, which was big enough to fit five of us in. And it had beans on toast and everything else the kids were demanding. It was cheap, massive portions, fast service and totally unpretentious. Sure it was lacking in a few frills -maybe some dressing on my salad or butter on my potato would have been good – but it was a good value meal for people who’d spent a bit too much money that morning. All of which is why we decided to follow it up with a slightly more prententious ice cream in Gelato 3BIS in Borough Market. The kids had the unadvertised “baby size” cones, which came with a Mickey Mouse wafer and cost around £2.90. I was being good and dairy-free and only had a lick of Eva’s (strawberry, delicious). There wasn’t much in the way of seating but we edged a few folks out and managed to sit together long enough to eat. And slobber a little at the sight of the gelato cakes in the freezer behind us. Then it was time for a quick play in the park next to the Tea House before the last mission of the day – pumpkin carving. 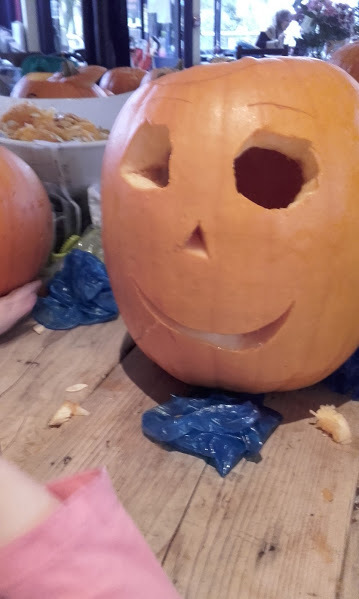 TeaHouseGrace had put out an appeal on Facebook for children to come and help pile a stack of 20 pumpkins and who were we to refuse the twin bribes of free snacks and free entertainment? 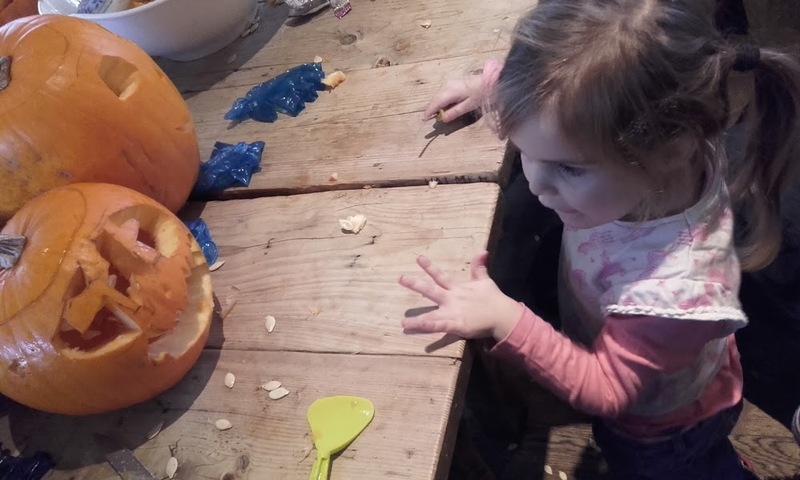 After all, just because it’s Halloween that’s no reason to abandon H&S and give the children sharp implements, is it? All of which, I think, made for a pretty good day out. Reuben declared it to be the best day of the week, which is high praise indeed. I’m still not convinced that The Shard was worth the entry price but if it makes him happy, who am I to place a value on it? 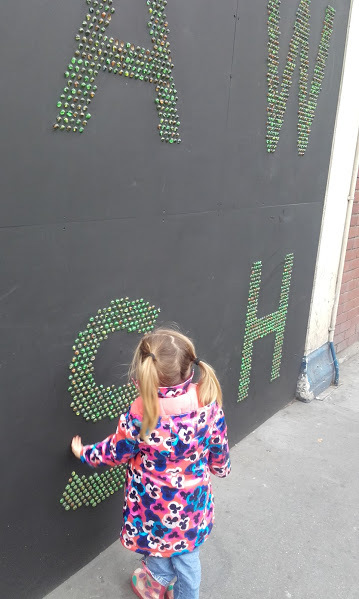 This entry was posted in Creating precious childhood memories or something (days out) and tagged cafe, eating out, playground, South London, tea. Bookmark the permalink.